A video posted to YouTube on Monday purportedly shows a large convoy of cars parading through eastern Libya with men displaying their support for the Islamic State (IS). The video shows a long line of vehicles driving through the streets of Derna with the black flag of IS clearly visible and men chanting slogans in support of IS, which has come to prominence in Syria and Iraq. 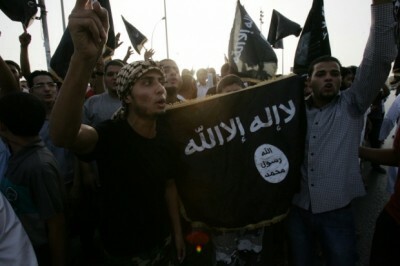 Al Arabiya reported the Ansar al-Sharia group had declared Derna an “Islamic emirate” and “pledged allegiance” to IS. Ansar al-Sharia is designated a terrorist organisation by the US who accuse them of being responsible for the 2012 killing of their ambassador Christopher Stevens in the eastern city of Benghazi. The group retain a strong presence in Benghazi, where there continues to be fierce fighting between their members and forces loyal to rogue army general Khalifa Haftar, who has led months of air strikes against “terrorists”. However, the EFE Spanish news agency reported the parade in Derna was by a new “radical militia” called Al Galuo, which “denies any links to Ansar al-Sharia” according to their security source who said it is made up of fighters returning from the conflicts in Syria and Iraq. Libyan analyst Mohamed Eljarh said he had information that a foreign emir will be appointed to rule the newly declared IS emirate in Derna. Libya has been racked by fighting and political division since the 2011 ouster of former leader Muammar Gaddafi. Rival cities, militias, tribes and parliaments are battling for control of Africa’s largest oil reserves in a country of just over six million people. The recently elected House of Representatives (HoR) has been forced to reconvene from Benghazi to the eastern town of Tobruk, where it has struggled to impose its authority over the capital Tripoli, which they have lost control of to the Misratan Led Alliance (MLA). The MLA has supported the General National Congress (GNC) to reconvene in Tripoli, which has announced a cabinet of its own as political divisions mirror violence between various groups across Libya. UN brokered peace talks between the rival political factions were held in the remote town of Ghadames on 29 September, with another round of discussions due to take place after the Eid al-Adha holiday. The UN has threatened sanctions “including asset freezes and travel bans” against those who reject the talks.